Contains all information needed to apply, including eligibility, key dates, selection criteria, application requirements, work sample specifications, technical support, and more. While not mandatory, we strongly encourage you to attend the application workshops. Workshops provide an overview of the application process, as well as hands on tips, strategies and tools for creating a competitive application. Applicants will be able to hear directly from current fellows, as well as past applicants and Kresge Arts in Detroit Staff. This workshop focuses on tips and strategies for creating an application that highlights your strengths and most compelling work through content selection, and work sample documentation. Facilitated by Creative Many Michigan, this workshop supports artists to craft effective resumes and concise, passionate artist statements. 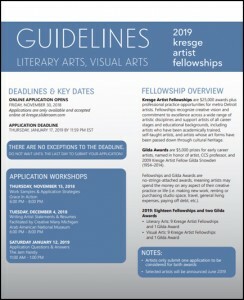 The strategies and tips shared are relevant to the 2019 Kresge Artist Fellowship application and more, such as grant applications, websites and marketing materials. Kresge Arts in Detroit staff will answer last minute questions and answers from fellowship applicants. We recommend you begin by working on your application offline as soon as possible. 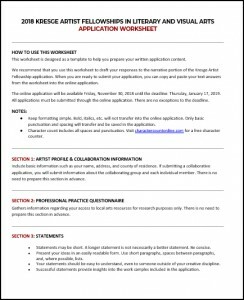 We have provided a worksheet that can be used as a template for you to prepare your application content before you enter it online. You may download this worksheet as a word document. The 2019 applications was open November 30, 2018 through January 17, 2019. We strongly recommend completing your application well in advance to avoid missing the deadline due to unforeseen technical problems. There are no exceptions to the deadline.